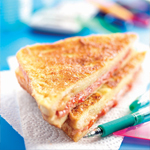 Perfect for an after school snack or for a tasty weekend brunch, these hot sandwiches will go down a storm with the whole family. 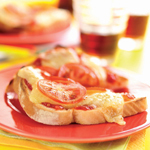 Spread the bread with butter and top four slices of bread with tomato chutney, ham and cheese. Sandwich together with the other slices of bread. Beat the eggs with a pinch of salt and pepper and pour into a large shallow dish. Dip the sandwiches one at a time in the egg, turning them until well coated with egg. Heat the oil in a large non-stick frying pan, add the sandwiches two at a time and cook for 2-3mins each side until the egg is golden brown. 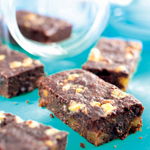 These sticky chocolate bars are perfect for packing into lunchboxes. They’re packed full of healthy dried fruit and bread, low in added sugar and compared to some biscuits and cakes low in fat too. What’s more they keep well – up to 5 days in an airtight container – that’s if they last that long! Preheat the oven to 170C/Fan 150C/325F/Gas Mark 3. 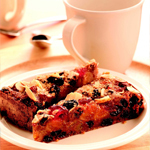 Lightly oil a 26×16.5cm/10×6.5in oblong cake tin and line with baking parchment. Break the bread into pieces and place in a large bowl. Warm the milk and cocoa together; pour over the bread and leave to soak for 10 mins. Use a fork to mash the bread until smooth. 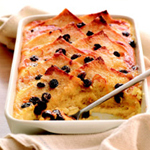 Place the apricots, raisins and orange juice in a small pan, bring to the boil. Remove from heat and cool. Beat the sugar and eggs together. Stir the egg mixture into the bread, along with the fruits and two thirds of the chocolate. Pour the mixture into the prepared tin and scatter over the remaining chocolate. Bake for 30mins or until firm to the touch. Leave to cool in the tin. Mix the raisins, zest and juice together and leave to soak for 10 mins. Preheat the oven to 170C/Fan 150C/325F/Gas Mark 3. Spread the bread with the butter and cut each slice in half diagonally. Beat the milk, cream, eggs, vanilla and 4 tbsp sugar together. Lay 4 slices of bread over the base of a 900ml/2pt shallow ovenproof dish. Arrange the remaining slices of bread on top, overlapping them slightly. Scatter over the raisins, zest and juice. Pour over the cream mixture and leave to soak for 15 mins. Scatter over the remaining caster sugar. Place the dish in a large roasting tin and pour boiling water from the kettle to come half way up the outside of the dish. Bake for 35-40mins or until the custard has set in the middle and top is golden brown. Serve hot or warm. 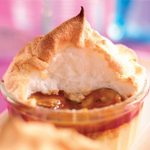 A twist on a real classic British pudding – layers of custard topped with bananas and toffee sauce and a crisp layer of meringue – who could resist? Jars of toffee spread are sold in most supermarkets with the jams, but if you prefer use chocolate spread instead. Preheat the oven to 170C/Fan 150C/Gas Mark 3. Butter a six 175ml/6floz ramekin dishes. Heat the milks together in a small pan until almost boiling. Stir in the breadcrumbs and mix well. Beat the three egg yolks together with one whole egg, add the milk mixture and mix well. Pour the mixture into the prepared dishes and bake for 25-30 mins or until just set. Top the custard base with the toffee spread and sliced bananas. Whisk the egg whites in a clean grease-free bowl until they form soft peaks. Fold in the sugar and spoon on top of the custard. Bake for a further 10-15 mins or until the meringue is set and pale golden. Serve warm. Kids and grown-ups alike will love these quick mini pizzas. They’re perfect for that quick and easy after-school snack. You can make them with white or wholemeal bread, whichever your family prefers. Toast the bread on both sides under a hot grill. Spread the toast on one side with the tomato chutney or sauce. Top with the tomato and cheese slices. Pop under the grill and cook for 2 mins or until the cheese is melted and golden. Cut into triangles and serve hot. This is a really tasty anytime dish that the whole family will enjoy. It’s sort of a cross between pizza and an omelette. Serve it warm with salad for a filling and healthy meal solution. Butter a 900ml/2pt shallow ovenproof dish. Cook the bacon under a hot grill for 4-5 mins, turning once, until crisp and golden. Cut into bite sized pieces. Meanwhile, spread the bread with the butter and the pizza sauce, remove the crusts and cut into triangles. 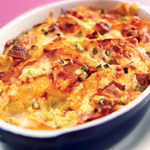 Arrange a layer of bread slices over the base of the dish, scatter over half the onions, bacon and half the cheese. Top with the remaining slices of bread, arranging them in overlapping slices. Scatter over remaining onion, bacon and cheese. Preheat the oven to 180C/Fan 160C/Gas Mark 4. Beat the egg and milk together with seasoning and pour over the bread. Leave to soak for 10 mins. Stand the dish in a roasting tin, pour boiling water from the kettle to come half way up the outside of the dish. Bake for 25-30mins or until golden brown. Serve warm with salad. Preheat the oven to 170C/Fan 150C/325F/Gas Mark 3. Lightly oil a 23cm/9in spring clip tin and line with baking parchment. Break the bread into pieces and place in a large bowl. Warm the milk; pour over the bread and leave to soak for 10 mins. Use a fork to mash the bread until smooth. Beat the sugar, eggs, spice and ginger syrup together. Stir the egg mixture into the bread, stir in the ginger and fruits. Pour the mixture into the prepared tin and scatter over the almonds and demerara sugar. Bake for about 1 hour or until firm to the touch and golden brown on top. Leave to cool.